Spring is definitely in full bloom. It brings a smile to my face to see people finally coming out of hibernation and spending more time together, which makes hosting a spring gathering a great idea. If you’re like me and want to invite some friends over to usher in the warmer weather, I have the most delicious recipe for you to try. Every time I make these Canadian Havarti and Zucchini Stacks I receive tons of compliments on them – the melted Havarti is absolutely mouthwatering and perfectly complements the sweetness of the baked zucchini slices. Not to mention that they’re easy to make, which makes them the perfect last minute addition to your party (one that will surely be welcomed by all). If you want to add a tasty wine to the menu, I recommend something like Quails’ Gate Chardonnay. It’s a crisp and smooth wine that’s beautifully balanced with tropical fruit aromas and a hint of oak. Another great wine to try is Featherstone Cabernet Franc from the Niagara Peninsula. It’s an extra dry wine that’s fermented in small batches and matured in oak barrels. Whatever you decide to make, I sure hope you make the best of this weather. It excites me to know that it’s only getting started! 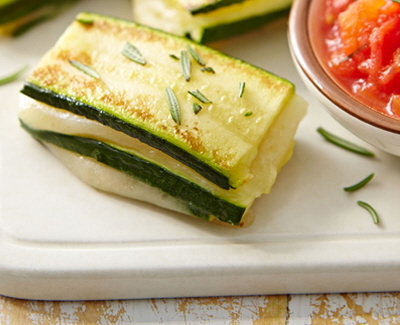 On a parchment-lined baking sheet, spread out the zucchini slices on one side and the tomato quarters on the other. Sprinkle with melted butter and rosemary; season with salt and pepper. Remove skin from tomatoes then place in a bowl. Crush with a fork. Alternate zucchini and Havarti slices in layers while the zucchini is hot, so that the cheese softens. Serve with the crushed tomatoes.